After my friend Danielle harassed me about it, I decided to attempt Project 365. It’s where you take one (or more) photos each and every day. I suppose y’all would get bored of a daily photo post from me but I hope it will help me get a bit more creative when it comes to my photography. 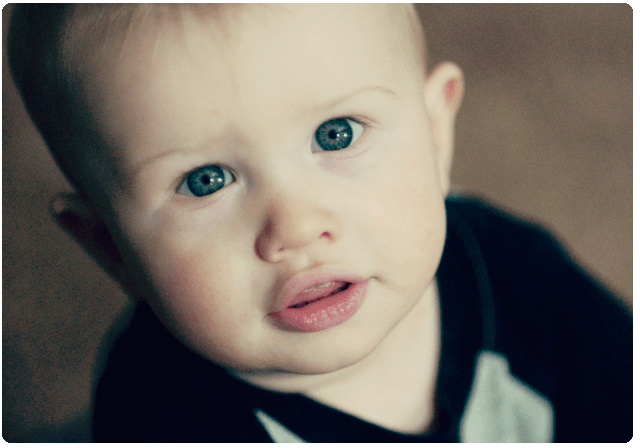 So this first photo is of my youngest son, Tristan. He’s a few days shy of being 15 months old! He is my uber nummies. If you are also doing Project 365, let me know! YES I am SO excited you’re doing the 365 too!!!! STOKED! I love your photos. Tristan seriously looks like a child’s doll in this one. So cute! Yay thank you! Hopefully I can keep it up lol. I started a 365 project on Tumblr. Of course, I am looking at your first picture of the year and thinking your 365 pictures are going to blow mine out of the water!! Pshh I’m not THAT good! Thank you though! Following you on Tumblr! Thank you! I need to come up with a 365 blogroll or something now so I can keep track of everyone! Such a lovely photo. :) I’m attempting Project 365 — I’m doing mine via the group/tag on Flickr. Thank you! I’ve never really been able to get into the community aspect of Flickr, even after having a pro account for YEARS! Also, more and more I’ve been just uploading/using WordPress for my photos… makes me wonder if I will renew Flickr this year! YAY!!!! I am SUPER excited you started one!!!! Hopefully I’ll be able to keep it up the whole year! I’m going to do one this year! I’m going to start the year off behind on posting, thought, because I’m away from my computer this weekend. I’m trying to decide if I want to blog the photos every day or maybe post to Flickr every day and do a weekly blog with photos. I was pondering that too, the DISPLAYING of the photos, and just decided to blog it every day. That’s an interesting idea! I’ve never taken on a project like this before so I have no idea how long I’ll last lol. He is so lovely. Looks so much like his brother! That should keep my blogging up to date, and get me back into my photography! Great idea! THANK you for saying that! It actually was a huge concern of mine that the boys wouldn’t LOOK like brothers because of their different biological fathers but Tristan really does look a lot like Danny and they have the same mouth (my mouth lol). I think I’d like to do this project. I can’t claim to even be a decent photographer but I think this will give me the opportunity to work on improving my skills. I am hoping this also breaks me out of my box. I tend to go ok… pretty flower… another pretty flower… so my GOAL I suppose, is to find the “special” in my surroundings every single day. I ended up starting a Project 365 blog: http://mylifein365.wordpress.com/. So far, so fun. I am in now way a photographer. We only have one cute little point and shoot camera, but I’m going to try it anyway. I have three young boys, and I find that far too long goes by without having any cherished photographs. This year, my goal is to use the Project 365 to take steps to make pictures and photography a priority in our family. Funny enough, before I REALLY got into photography, I actually took MORE photos. Now I am super critical of my work lol. I know you already know this, but I am doing Project365, too. ;) I have my blog set up to automatically pull and post my 365 photos, and I think that happens at midnight, don’t remember exactly. I’m also posting on Flickr and Facebook! Added your link in my blogroll for 365 on my Links page! Thank you! I hope I succeed with this project! Oh geez, it’s amazing how quickly children change in “just” one year! I just added a blogroll on my Links page for those doing 365! Aww thank you, he is my nummy nums! I’ve started one too! I actually started a separate blog for it, separate from my regular one. I really hope I can keep up with it! Awesome! What’s the link so I can add it to my blogroll? It will be so fun to see everyone’s year in pictures! I know! He’s so much of a toddler now. Tantrums and all LOL! OH yes. Tristan loves to walk up to my box (desktop computer) and bash the hell out of the keyboard. Drives me NUTS! Ooh! I started my Project 365 last night and I’m so excited to see all the changes as they occur in my family… work on the house, toddler growing up, new baby in April… Whee!!! It’s amazing to look back and see how much life changes, how much the kids grow, etc! I’m doing Project 365. I used to always participate in these types of challenges, but then I let “business” get in the way of photography and in 2011 I’m turning that back around. It’s going to be fun on the days when I realize I haven’t taken my picture yet! Did you see the Clickin’ Moms 365 starting off? Do you think you’ll be posting to that? I’ve got to decide if I should/can do this?! I actually canceled my membership! I got frustrated with it because it really seems more geared towards “people/children” photography which I don’t do very often and didn’t feel like I had anything to offer because of that limitation. Aww thank you! My womb only produces squishy adorable children apparently! Thank you so much for inspiring me to start my own blog! I came across your posts of Project 365 and thought it was a wonderful idea! !